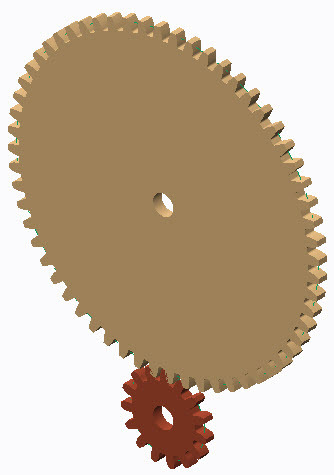 These gears have involute teeth so will mesh correctly and transmit motion smoothly. The zip file contains a PDF that explains how everything works including exporting a DXF to cut the gears on a laser cutter. Great document, Tim! Generating that involute always gets me. Do you have the non-educational version of Creo available? I cannot open the models with the full version of Creo. That's beautiful Tim! One of my FIRST, FRC coaches is also a physics teacher. I was mentioning the importance of involute tooth geometry and hadn't gotten back to him on decent documentation! Thank you for taking care of that for me! I especially like the involute equation in developing the tooth geometry for these gears! Dude, we really need to get you involved in mentoring a FIRST team!! Tim - This is excellent and really demonstrates the power of a parametric drawing program. Is it just me or is the mesh between the gears incorrect? Unfortunately, I don't yet know enough about the Mechanism Application to put this right for myself. I look forward to 'playing' with this more. Thanks for the kind words. When setting up a a gear connection its possible to align the teeth but when one of the gears is resized the mesh changes. It's possible to realign the teeth after re-sizing. The Precision LMS modules on mechanisms should fill in all the gaps. I cannot claim the credit for the individual models. I believe the original came from a German AE, It worked really well but was not very student friendly with no annotation and letters representing variables. Adam Haas did a major re-design on the parametric gear model with variable names and annotations. I created the gear assembly so students can define the ratio and run the analysis to check everything works before outputting to manufacture. We are in disussions with the Institute of Engineering and Technology (IET) about launching FTC in the UK but funding is a stumbling block for them and prospective teams. Last time I checked, the FTC kit costs nearly £1000 ($1500) here in the UK and that doesn't include the entry fees!